There are literally thousands of historical films that document the tragedies and triumphs of men. From war epics to biopics about world leaders, scientists and rock stars, according to the cinema the history of mankind is considered to be more important than the history of womankind. That’s not to say that there aren’t a lot of female driven period films out there, but the last significant one I can recall is The Iron Lady, and no one really considers that film to be the greatest cinematic masterpiece of the 21st century. It may seem naïve, but I dream of a world where historical films about important female leaders like Angela Merkel, female scientists like Marie Curie, and female rockstars like Janis Joplin, are just as numerous as those about men. The lack of female driven historical dramas and stories about women is exactly why Sarah Gavron’s Suffragette is so incredibly important. It’s London, 1912; women have been quietly protesting for the right to vote for decades with no avail. A 24-year-old woman, Maud Watts (Carey Mulligan), toils away in a laundry everyday alongside her husband Sonny (Ben Whishaw). Working there since the age of seven, she faces discrimination and harassment from her vile boss. With a small son to look after, Maud’s future depends on her ability to keep making an income whilst also maintaining her status as mother and wife. When Violet (Anne-Marie Duff) starts to work in the laundry, she introduces Maud to the suffragette movement and persuades her it is possible for men and women to be equal. Along with other local women, including pharmacist Edith Ellyn (Helena Bonham-Carter), Maud and Violet perform acts of defiance, many of which result in their arrest. A police officer (Brendan Gleeson) starts to become concerned for the wellbeing of Maud and urges her to return her former life before it’s too late. Maud’s transformation from a passive bystander to full-blown supporter of the suffragette movement is a devastatingly quick process. Sonny is blindsided by her newfound power and reacts by casting Maud out of their home and preventing her from seeing their son. As soon as Maud realises that her voice is important and can make a difference to the cause, her actions become more and more extreme, going from simply making a speech in parliament to blowing up letterboxes. Although the film is a work of fiction, it is still very much grounded in detailing real-life historical events and representing the women who contributed to the suffragette movement. Bonham Carter’s character Edith is based on a combination of real-life suffragettes Edith New and Edith Garrud, and the tragic figure of Emily Davison (Natalie Press) features prominently in the second half of the film. And although she is on virtually every piece of advertising material for the film, Meryl Streep stops by for just two minutes to portray leader of the British suffragette movement, Emmeline Pankhurst, giving a rousing speech to her foot soldiers of the cause. The film has received an extensive amount of criticism, primarily in the US (where it has failed to gain the large audience it had in the UK) due to the lack of women of colour in the film. As some critics have argued, there were many WOC in London during that time who were a part of the suffragette movement who are noticeably absent from the film. For instance, Indian princess Sophia Duleep Singh was one of the leaders of the suffragette movement in Britain. Even though the British people had reduced all Indian migrants (rich and poor, men and women) to the lowest class, behind the white working class, she believed in uniting sisterhood and fighting for both the right for British women’s voting rights and for the emancipation of Indian women as well. Her appearance in the film would have been fantastic, even as a small but important cameo like Streep as Pankhurst. Maud is clearly meant to represent the “every woman” with her lower-working class background and expulsion from her previous life when she decides to stand up and speak out. Her story could apply to many women of the era, and although she cannot represent every woman (including WOC) she is still a very universal figure. However, the inclusion of a few WOC – specifically the prominent Indian Suffragettes – even as supporting characters would have been a welcomed relief to the constant whiteness of the film. Perhaps even a parallel story about a working class English-Indian suffragette would have been a creative way to contrast the different struggles faced by women in the movement. The film is beautifully directed by Sarah Gavron, who offers an unromanticised vision of foggy London town we don’t get to see often on film. The harsh and stoic cinematography is a visual representation of the arduous journey these women face in combating inequality. Critics who say that the film is too dull and too safe are obviously missing the point of Gavron’s attempts to bring a sense brutal realism to the film. Through languid pacing and the use of the London setting and Royal figures appearing in the film, Gavron juxtaposes a restrained British sensibility with the confronting reality filmography the Suffragette movement. The performances are solid throughout with Mulligan excelling in her role as Maud, using a mixture of determined rage and fragile misfortune to make her a sympathetic character. Suffragette isn’t a story about the entire suffragette movement nor is it a story about how important Emmeline Pankhurst was to the cause. It is a story about one woman’s struggle to accept that her voice is important and needs to be heard. In a day and age where historical films led by women are few and far between, Suffragette is a welcome change in a male-dominated field. We need more films like it and we need a more diverse range of female stories on the screen. But this all leads to the question, where is my Hedy Lamarr biopic? 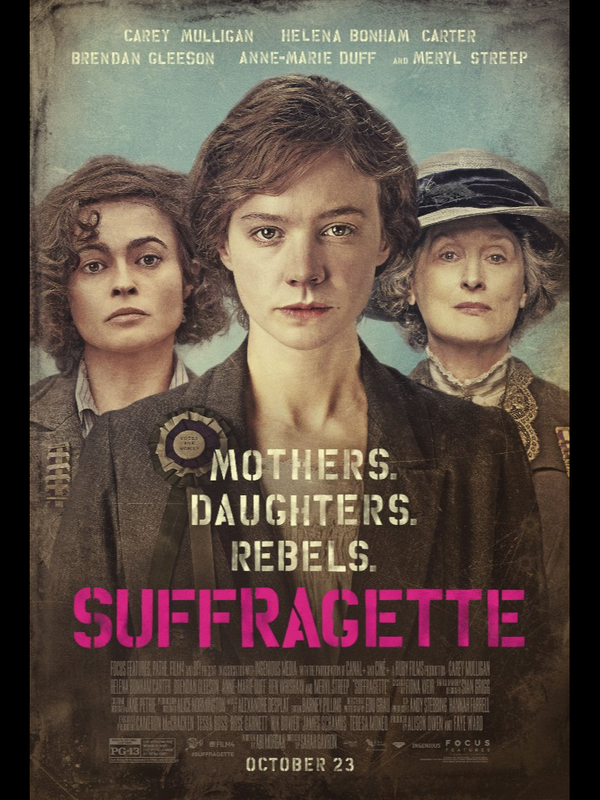 Suffragette successfully captures the hardship and bravery of the British women’s suffrage movement, while also showcasing a wonderful performance from Carey Mulligan. Technically, it’s skillfully written and directed, boasting appealing visuals and a strong character arc. While the film sometimes feels methodical in its approach, its heart and message are in the right place — and, sadly, it’s still relevant. This entry was posted in Film and tagged feminism, film, film review, women. Bookmark the permalink.